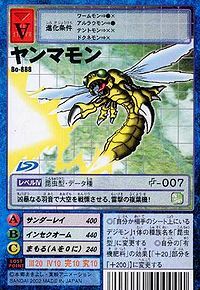 An Insect Digimon that took in the data of a jumbo dragonfly. Despite its slender appearance, it has a violent personality, and its body is covered in an extremely tough carapace. 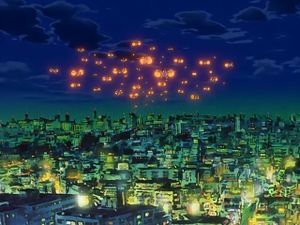 From Oniyanma (鬼蜻蜓（オニヤンマ）), the Jumbo dragonfly. Anime/Manga Digimon Savers: "Digimon Boy Ikuto, The Forest Keeper Jyureimon"
Thunder Ray  サンダーレイ Sandā Rei Fires a beam of electricity. Somersault Kill  サマーソルトキル Samāsoruto Kiru Performs a somersault in midair to hit the enemy with its tail. Sonic Bite  ソニックバイト Sonikku Baito Use its sharp jaws to bite swiftly. Assassin Arrow  アサシンアロー Asashin' Arō Attacks by firing arrows of energy from the tail. 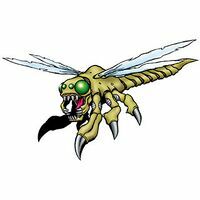 Insect Swarm / Insect Om  インセクスオーム Insekusu Ōmu Summons a swarm of wasps to attack the enemy, or produces a strange soundwave to curse the enemy. Yanmamon carries Gottsumon around the Digital World. Yanmamon is an obtainable Digimon. It can evolve into Pumpmon (0+ JP). Yanmamon is the wild Digimon that can be found in Asuka Wind Prairie. 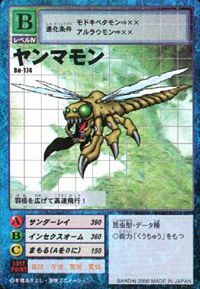 Another Yanmamon with alternate color green can be found in Asuka Bulk Swamp. 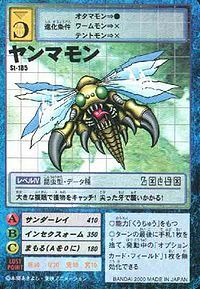 Yanmamon is an obtainable Digimon card that belongs to White card with 1 S-Energy cost and has 6 AP / 8 HP. 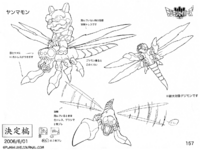 Yanmamon is an obtainable evolution of Lalamon. 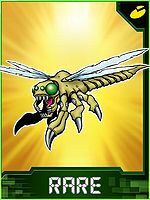 Yanmamon is available as a Digimon Medal. It catches sight of prey with its huge compound eyes, and attacks with its sharp fangs! It spreads its wings and flies at high speeds! This electric-attacking biplane emits a vicious buzz from its wings that causes the skies to quiver! This page was last modified on 15 April 2019, at 22:35.